I happened across The Great Grammar in the kids' section of a local charity shop and I had to buy it. Come on. It's an interactive/pop-up children's book about grammar. How could I not buy it?I don't regret it at all. The Great Grammar presents grammatical concepts - nouns, proper nouns, verbs, adjectives, adverbs, pronouns, prepositions, conjunctions, plurals, the state of belonging, punctuation and sentence formation - in a way that is colourful and fun and encourages a child to think and engage with the material. It isn't one of those half-hearted pop-ups. There are bits to spin and pull and twist and lift everywhere. I'd imagine the pop-ups are pretty sturdy too as my copy has three kids' names at the front and is only missing a couple of parts. It genuinely is interactive.It's great to see grammar being presented in such a fun way. It's a great way of showing a child that it's not just boring lists of rules. This book reminds me of 'the jolly postman'- purely because of the pulling out tabs and the amount of engagement the reader has with the writing. This is by far the most fun I've had learning about grammar, and I'm sure by making the reading involved it will help them learn about the correct use of words and punctuation! Another great book by Kate Petty. 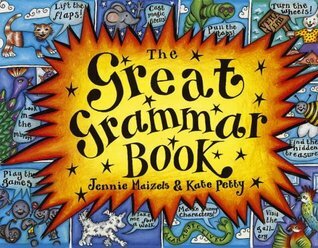 This is effectively a Grammar Made Easy book for children just starting out but would be really helpful for children mixing up some areas still too. Riddled with colour, interaction and fun characters this book is difficult to fault. Divided into 9 distinct sections, Petty tackles each area by simplifying the meaning of a Noun, for example, and then giving colourful and action packed examples for children to get involved with. I love how this makes kids work out for themselves the answers without the answers being there straight away so you can really gauge their understanding, rather than their ability to regurgitate what they've already read! This covers Nouns, Verbs, Adjectives, Adverbs, Pronouns, Prepositions, Conjunctions, Plurals and Punctuation in an easy and simple manner. Each page has a different theme, as well as different subject, with the recurring characters you meet on the first page. I like the continuity of these characters and the themes add an extra talking point for when children become tired or restless. The various flaps, pulleys, wheels and tabs are all linked together - a really nice addition to each page. This means that when you turn a wheel, for example, a word might pop up somewhere on the page. This really adds to the interaction within the page and makes the learning a more memorable experience - hopefully! Some of the flaps, particularly the large pop ups, are a bit stiff the first time but this wears off once you've stretched them out a bit; although I did feel this made me feel more confident they were sturdy and less likely to become dog-eared or torn after the first use!There are limited examples within this book in terms of practising what you've been reading. I think for readers just starting out this is absolutely fine, and there is plenty to talk about on each page anyway even away from the designated examples because the pages are so crammed with colour and creatures. However for those readers familiar with some of these areas already this might be a little too simple.Overall, a beautifully illustrated, fun and extremely interactive book which is just perfect for teaching your little ones the basics of Grammar - plus it's not too dull for you either! I can't get over quite how much thought has gone into each page!This product was provided to me by the publishers in exchange for an honest review; this in no way influenced my opinion of this book. Wow - Fantastic Grammar Pop-Up BookThank you to the publisher Walker books for my ARC (Advance Review Copy) which was sent to me free with no obligation to review.I'll be honest in that if I could give this pop up book more than 5 stars I truly would as I am incredibly impressed with it. I am now keeping my eyes out to see if any of the authors other books (aside from The Terrific Times Tables Book as we also have that book) are published as it looks like the author published quite a few of these pop up books a few years ago and that they are now being updated and re-released.If there is any way that a child is going to learn anything then surely it has been proven to be by encouragement and fun (I'm not in education as my profession just to make this clear and so I'm not speaking for that profession) and this pop up book is incredibly fun. I requested this to review thinking of my oldest child but my youngest child is also completely enamoured with this and the times table book and so already it has proven to be a big hit. I only have to consider some of the things my eldest has learnt through unrecognised teaching elements such as STEM from the Blaze and the Monster Machines cartoon to know that fun is the way to go and already he is able to quote a few doing words (verbs) to me.I would never ever normally video review a book but with the movable features I felt this may be a good thing to show and so I have attached a video and some photos to show the book on my Amazon review. I originally recorded the whole book and then realised this may lead to some sort of copyright infringement and so I've shortened the attached video down so apologies for any jumpy transitions.The book is based on Grammar and so teaches;NounsVerbsAdjectivesAdverbsPronounsPrepositionsConjunctionsPluralsBelongingsPunctuationThe SentenceAs an adult I am honestly hand on heart blown away by the detail in this book and the pop up element and sliding, pulling etc but it is the educational element that really shines through the fun.